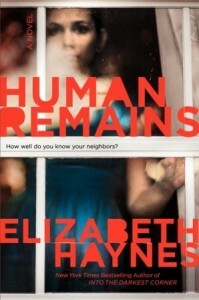 New York Times bestselling author Elizabeth Haynes returns with a disturbing and powerful tale that preys on our darkest fears. Police analyst Annabel wouldn’t describe herself as lonely. Her work and the needs of her aging mother keep her busy. But Annabel is shocked when she discovers her neighbor’s decomposing body in the house next door, and she is appalled to think that no one, including herself, noticed the woman’s absence. Annabel sets out to investigate, despite her colleagues’ lack of interest, and discovers that such cases are frighteningly common in her hometown. A chilling thriller and a hymn to all the lonely people whose individual voices haunt its pages, Human Remains shows how vulnerable we are when we live alone, and how easily ordinary lives can fall apart when no one is watching. Visit her at elizabeth-haynes.com, connect with her on Facebook, and follow her on Twitter.